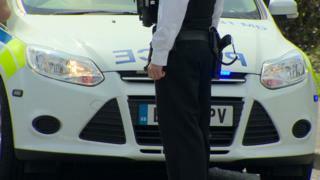 A pipe bomb exploded outside a home in County Armagh in what police have described as a “reckless” attack. A woman and young children were inside the house in the Enniskeen area of Craigavon when the blast happened at about 23:20 GMT on Saturday. They were not hurt and the property was not damaged. Army bomb experts who were sent to the scene found a second pipe bomb and have taken it away for a forensic examination. A number of houses were evacuated during the security alert. It ended early on Sunday morning and residents have been allowed to return to their homes. “This was a reckless attack by those responsible,” said a Police Service of Northern Ireland spokesperson. “We are extremely fortunate that we are not dealing with any serious injuries or worse today. Democratic Unionist Party MLA Carla Lockhart, who represents the area, said: “Craigavon doesn’t need this and these families certainly don’t.